Tintri has updated its Tintri OS and is adding a vRealize Orchestrator plug-in, container and cloud support, serving notice it is to extend predictive analytics to include host compute and memory resources. lastly, it seems to be looking to add a chatbot interface. The company sees storage arrays, whether all-flash or bybrid, becoming commodity components in a system stack managed by system level people using VMware and Hyper-V-based facilities to orchestrate container, virtual machine, on-premises compute, storage and networking, and out to the public cloud. It is set on developing its array interfaces to ensure that the arrays play exceedingly well with each other in such environments, with RESTful API access to everything and upwards integrations with infrastructure management entities like vRealize. Tintri CTO and co-founder Kieran Harty says Tintri has a Web Services approach and everything is API-accessible. Hyper-V, Containers and OpenStack have this approach. Storage arrays in general do not, any APIs not being defined at the right level. Tintri says it is doing it right and applying APIs at VM-level, and interacting with APIs on the compute side and with NSX/ACI on the network side. 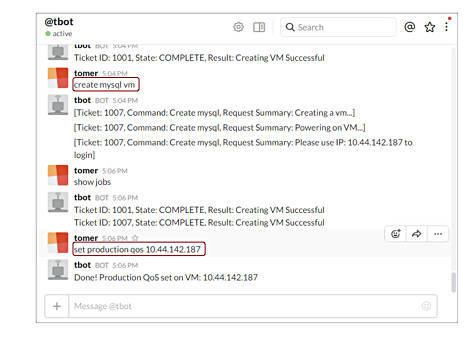 Tintri's vRealize Orchestrator is a plug-in for vRealize Automation and vCloud Director and exposes Tintri operations to higher-level management and orchestration platforms. This plug-in automates storage operations, such as snapshot, clone, replicate and copy data management, at the VM-level. This integration can be used to build workflow, with Harty saying: "No one else can do it at the VM level." VMware container support is coming to Tintri arrays with vSphere Integrated Containers, part of vSphere 6.5. This means VMware customers can add container support without re-architecting their entire infrastructure. Tintri's support mean users get container level Quality of Service (QoS), and real-time and predictive analytics. Tintri will also support Docker Volumes containers via a Flocker plugin supported by ClusterHQ. Users running containers on bare metal will be able to store persistent Docker Volumes on Tintri storage. This also means Tintri automatically plugs in to container orchestration platforms such as Kubernetes, Apache Mesos and Docker Swarm. You will be able to mix and match containers and VMs on the same Tintri system. The container support is coming in the first half of next year. Tintri OS is getting S3 support and Snapshots from Tintri arrays at VM level, and can be sent to Amazon's S3 service and to IBM's Cloud Object Storage – the acquired Cleversafe object storage. To recover, just restore the VM with no need to do anything at the LUN and volume level. In theory, any S3 target could be used, but S3 interfaces vary, so test out any proposed ones apart from Amazon 33 and IBM COS.
Tntri is extending its predictive analytics to support compute and storage at the same time. Harty says Tintri does real-time analytics on storage and compute now. This is getting extended to predictive analytics, modelling such things as percentage CPU utilisation and memory size. It will move to a lower level taking account of such things as Xeon model and core count, and be delivered as a service over the web. Extending predictive analytics to support compute (meaning processesing and memory) will be available in the first half of 2017. Chatbots are lumps of software providing everyday language responses to everyday language inputs, and backed up by AI and/or machine learning to provide intelligent input text analysis and an intelligent response. They should be inherently more flexible than strictly formatted Command Line Interfaces (CLIs) and potentially quicker to use than GUI forms. Chatbots can be text- or voice-based. Example voicebots are Amazon's Alexa, Apple's Siri and Microsoft's Cortana. Harty says a Japanese Tintri customer set up a chatbot interface to their array using Tintri's API. This Slack Bot would know an admin's credentials and so could be multi-tenant-aware and assign different roles to different tenants. Harty emphasises that this is not something you could do with Nimble, Pure, EMC et al. People could have a totally customised interface to their systems. There is an obvious extension to voice-driven bots. In theory Amazon's Alexa could be layered on as a front-end so that admins could speak to their arrays to get things done – sending snapshots to the cloud, spinning up and moving VMs, firing up analytics and more. This brings another potential application of the technology with people talking to the chatbot through their smartphones. Harty says Chat Ops are do-able today: "We'll offer it as a service and make it easier to use." What Tintri is seeing is that supplier differentiation at the product hardware level is rendered null by commoditised hardware. Differentiation through basic data management services, such as snapshots, is pointless too. These are simply table stakes. Differentiation by the amount of and type of integration into the upper layers of a customer's general infrastructure stack is becoming, it thinks, crucial. There is still scope for making the storage admin's life easier and better and the chatbot notion is aimed at this. If Tintri delivers chatbot access to all its services then everything to do with array management could be handled at a chatbot level. Hey Tintri: What happens if I move 500 VMs from the cloud to the on-premises stack? You will need 2TB more storage in the array, 20 more Xeon i7 cores and another 20GB of DRAM.